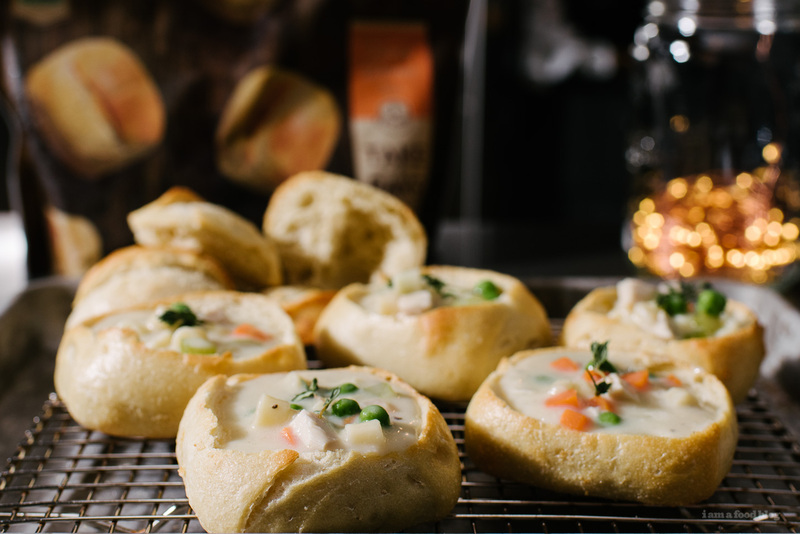 Mini hot and crispy bread bowls filled with creamy chicken noodle soup. Have your cute and eat it too! It’s soup season! Mike and I are eating every bowl of ramen we come across and we’re still not ramen-ed out because how could anyone get tired of carbs and soup? 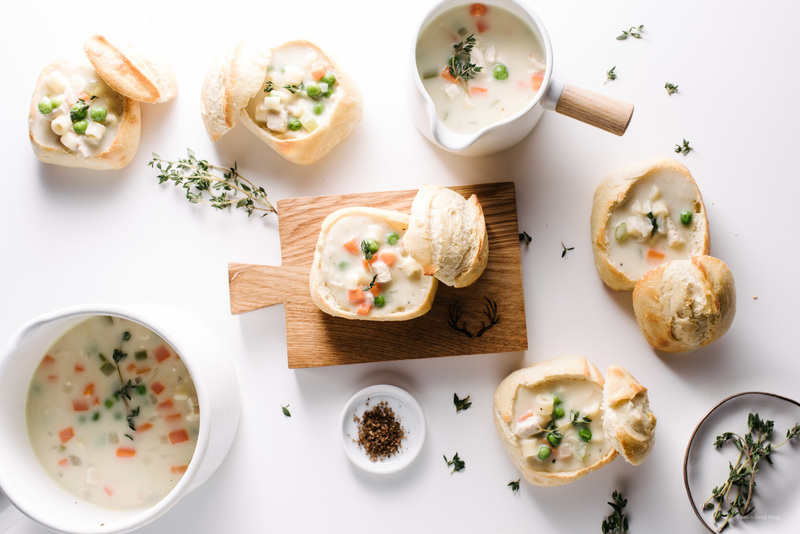 Speaking of carbs and soup, I made this gem before we left: creamy chicken noodle soup in baby bread bowls. Anyway, I was going to do clam chowder but instead wanted to something that was just a bit different, but not too different. Mike and I were chatting about the different kinds of soup that we could make: broccoli and cheddar, beef and barley, potato. I remarked that they were all brown or white and wondered why there weren’t any variations in color. Mike mentioned clear soup, like chicken and then I thought of creamy chicken and miso and here we are. Not the most exciting story, but sometimes all you want is creamy comfort. PS – Here’s the link to some coupons for La Brea Bakery Take and Bake! Bake the La Brea Bakery French Rolls according to the package instructions. 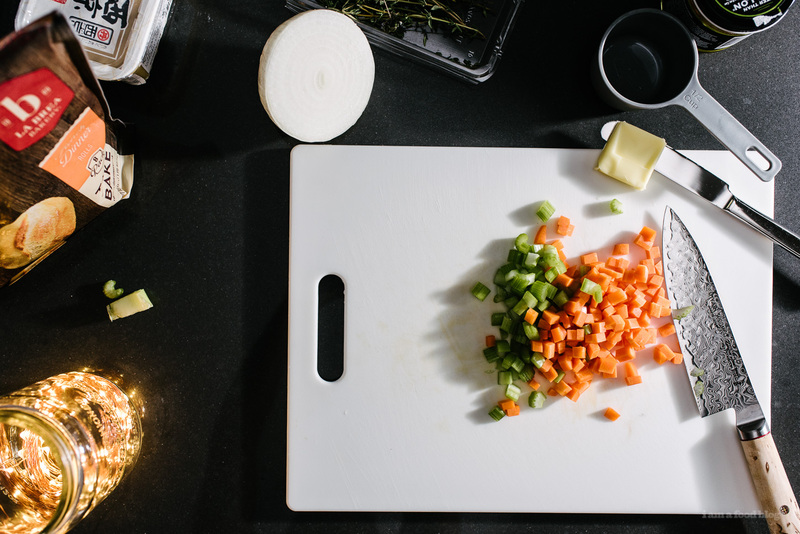 While the rolls are baking, make the soup. In a pot, heat up the butter over medium high heat. When melted, add the onion and carrot. Cook, stirring, until slightly soft, 1-2 minutes. Sprinkle in the flour and stir to incorporate completely. Pour in the chicken broth in a thin stream and whisk constantly. Add the noodles and bring to a simmer to cook the pasta, timed according to the instructions on the box. Stir in cream and then the miso to taste. Stir in the chicken and peas. When the peas are warm, about 1 minute, season with salt and freshly ground pepper to taste. 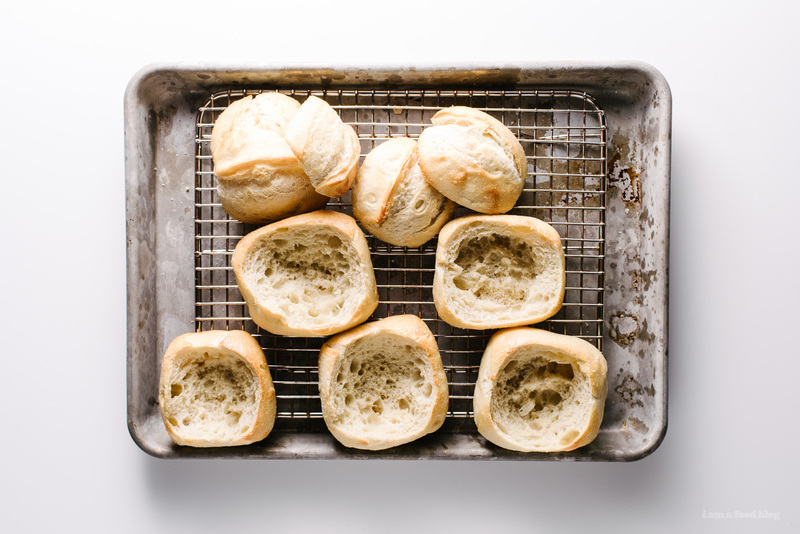 After the rolls are slightly cool, cut them into bread bowls: use a small knife to carefully cut off the top third of the roll. Hollow out the centers and fill with soup. Garnish with thyme and enjoy! This post was sponsored by La Brea Bakery Take & Bake French Rolls and Demi Baguettes, now exclusively available at select Walmart locations in the frozen bread aisle. Thanks for supporting I am a Food Blog! My first bread bowl was a monster of a thing from Panera bread, filled with broccoli cheddar soup. It was tasty, but I like the look of this much better. Oh this sounds so delicious and I love the bread bowls, such a good idea! heehee cute food tastes better, right? miso in creamy chicken noodle soup?!?! YES YES. miso in all da things!! These look so good!! We make smoked salmon sourdough bread bowls every year at this time. So so good!! 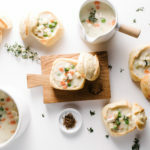 Creamy chicken noodle soup seems like such a logical bread bowl soup! Yum!! mmmm smoked salmon bread bowls sound AMAZING! Is there a way to freeze these for future meals? you can freeze the soup! the bread bowls are actually found in the frozen aisle, so you’re good there! Best. Idea. Ever!! The miso, the teeny bread bowls, all of it! aww thanks cynthia! 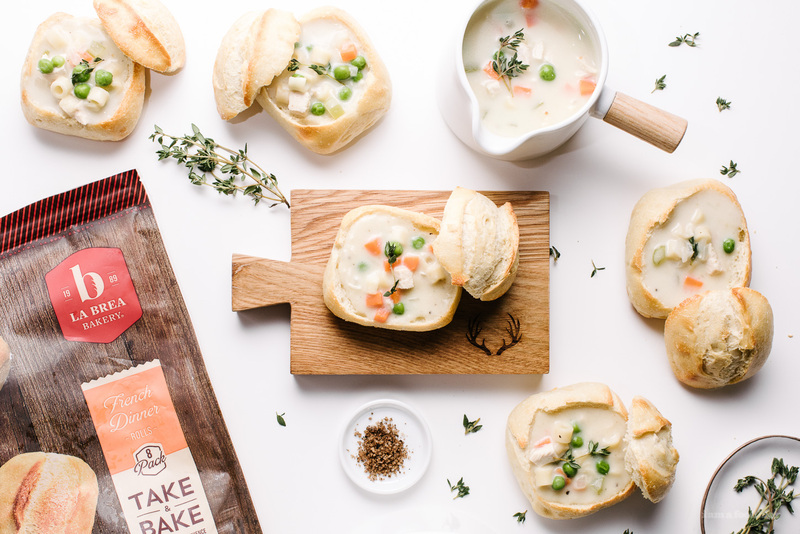 sending some teeny bread bowls filled with soup your way! Where is the cute wooden-handled spouted pitcher from? What kind of cream exactly?